For the song, see South Australia (song). For the southern region of Australia, see Southern Australia. "South Australian" redirects here. For the 1838–1851 newspapers, see The South Australian. For the sailing ship, see South Australian (clipper ship). Evidence of human activity in South Australia dates back as far as 20,000 years, with flint mining activity and rock art in the Koonalda Cave on the Nullarbor Plain. In addition wooden spears and tools were made in an area now covered in peat bog in the South East. Kangaroo Island was inhabited long before the island was cut off by rising sea levels. The first recorded European sighting of the South Australian coast was in 1627 when the Dutch ship the Gulden Zeepaert, captained by François Thijssen, examined and mapped a section of the coastline as far east as the Nuyts Archipelago. Thijssen named the whole of the country eastward of the Leeuwin "Nuyts Land", after a distinguished passenger on board; the Hon. Pieter Nuyts, one of the Councillors of India. The coastline of South Australia was first mapped by Matthew Flinders and Nicolas Baudin in 1802, excepting the inlet later named the Port Adelaide River which was first discovered in 1831 by Captain Collet Barker and later accurately charted in 1836–37 by Colonel William Light, leader of the South Australian Colonization Commissioners' 'First Expedition' and first Surveyor-General of South Australia. The land which now forms the state of South Australia was claimed for Britain in 1788 as part of the colony of New South Wales. Although the new colony included almost two-thirds of the continent, early settlements were all on the eastern coast and only a few intrepid explorers ventured this far west. It took more than forty years before any serious proposal to establish settlements in the south-western portion of New South Wales were put forward. On 15 August 1834, the British Parliament passed the South Australia Act 1834 (Foundation Act), which empowered His Majesty to erect and establish a province or provinces in southern Australia. The act stated that the land between 132° and 141° east longitude and from 26° south latitude to the southern ocean would be allotted to the colony, and it would be convict-free. In contrast to the rest of Australia, terra nullius did not apply to the new province. The Letters Patent, which used the enabling provisions of the South Australia Act 1834 to fix the boundaries of the Province of South Australia, provided that "nothing in those our Letters Patent shall affect or be construed to affect the rights of any Aboriginal Natives of the said Province to the actual occupation and enjoyment in their own Persons or in the Persons of their Descendants of any Lands therein now actually occupied or enjoyed by such Natives." Although the patent guaranteed land rights under force of law for the indigenous inhabitants it was ignored by the South Australian Company authorities and squatters. Survey was required before settlement of the province, and the Colonization Commissioners for South Australia appointed William Light as the leader of its 'First Expedition', tasked with examining 1500 miles of the South Australian coastline and selecting the best site for the capital, and with then planning and surveying the site of the city into one-acre Town Sections and its surrounds into 134-acre Country Sections. Eager to commence the establishment of their whale and seal fisheries, the South Australian Company sought, and obtained, the Commissioners' permission to send Company ships to South Australia, in advance of the surveys and ahead of the Commissioners' colonists. The Company's settlement of seven vessels and 636 people was temporarily made at Kingscote on Kangaroo Island, until the official site of the capital was selected by William Light, where the City of Adelaide is currently located. The first immigrants arrived at Holdfast Bay (near the present day Glenelg) in November 1836. South Australia was the second Australian state to be settled by free colonists, the first being the free Swan River colony in Western Australia, however in 1849 Western Australia was formally constituted as a penal colony. 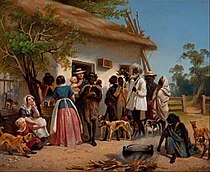 Although South Australia was constituted such that convicts could never be transported to the Province, some emancipated or escaped convicts or expirees made their own way there, both prior to 1836, or later, and may have constituted 1–2% of the early population. The plan for the province was that it would be an experiment in reform, addressing the problems perceived in British society. There was to be religious freedom and no established religion. Sales of land to colonists created an Emigration Fund to pay the costs of transferring a poor young labouring population to South Australia. In early 1838 the colonists became concerned after it was reported that convicts who had escaped from the eastern states may make their way to South Australia. The South Australia Police was formed in April 1838 to protect the community and enforce government regulations. Their principal role was to run the first temporary gaol, a two-room hut. The terrain consists largely of arid and semi-arid rangelands, with several low mountain ranges. The most important (but not tallest) is the Mount Lofty-Flinders Ranges system, which extends north about 800 kilometres (500 mi) from Cape Jervis to the northern end of Lake Torrens. The highest point in the state is not in those ranges; Mount Woodroffe (1,435 metres (4,708 ft)) is in the Musgrave Ranges in the extreme northwest of the state. The south-western portion of the state consists of the sparsely inhabited Nullarbor Plain, fronted by the cliffs of the Great Australian Bight. Features of the coast include Spencer Gulf and the Eyre and Yorke Peninsulas that surround it. The principal industries and exports of South Australia are wheat, wine and wool. More than half of Australia's wines are produced in the South Australian wine regions which principally include: Barossa Valley, Clare Valley, McLaren Vale, Coonawarra, the Riverland and the Adelaide Hills. See South Australian wine. South Australia has boundaries with every other Australian mainland state and territory except the Australian Capital Territory and the Jervis Bay Territory. 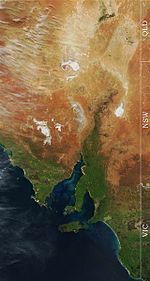 The Western Australia border has a history involving the South Australian government astronomer, Dodwell, and the Western Australian Government Astronomer, Curlewis, marking the border on the ground in the 1920s. In 1863, that part of New South Wales to the north of South Australia was annexed to South Australia, by letters patent, as the "Northern Territory of South Australia", which became shortened to the Northern Territory (6 July 1863). The Northern Territory was handed to the federal government in 1911 and became a separate territory. According to Australian maps, South Australia's south coast is flanked by the Southern Ocean, but official international consensus defines the Southern Ocean as extending north from the pole only to 60°S or 55°S, at least 17 degrees of latitude further south than the most southern point of South Australia. Thus the south coast is officially adjacent to the south-most portion of the Indian Ocean. See Southern Ocean: Existence and definitions. The southern part of the state has a Mediterranean climate, while the rest of the state has either an arid or semi-arid climate. 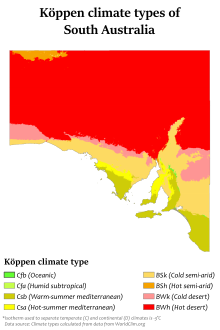 South Australia's main temperature range is 29 °C (84 °F) in January and 15 °C (59 °F) in July. The highest maximum temperature was recorded as 50.7 °C (123.3 °F) at Oodnadatta on 2 January 1960, which is also the highest official temperature recorded in Australia. The lowest minimum temperature was −8.2 °C (17.2 °F) at Yongala on 20 July 1976. Vineyard in Eden Valley. South Australia's wine industry is the largest in Australia. South Australia's average annual employment for 2009–10 was 800,600 persons, 18% higher than for 2000–01. For the corresponding period, national average annual employment rose by 22%. South Australia's largest employment sector is health care and social assistance, surpassing manufacturing in SA as the largest employer since 2006–07. In 2009–10, manufacturing in SA had average annual employment of 83,700 persons compared with 103,300 for health care and social assistance. Health care and social assistance represented nearly 13% of the state average annual employment. The manufacturing industry plays an important role in South Australia's economy, generating 11.7% of the state's gross state product (GSP) and playing a large part in exports. The manufacturing industry consists of automotive (44% of total Australian production, 2006) and component manufacturing, pharmaceuticals, defence technology (2.1% of GSP, 2002–03) and electronic systems (3.0% of GSP in 2006). South Australia's economy relies on exports more than any other state in Australia. South Australia's credit rating was upgraded to AAA by Standard & Poor's Rating Agency in September 2004 and to AAA by Moody's Rating Agency November 2004, the highest credit ratings achievable by any company or sovereign. The State had previously lost these ratings in the State Bank collapse. However, in 2012 Standard & Poor's downgraded the state's credit rating to AA+ due to declining revenues, new spending initiatives and a weaker than expected budgetary outlook. South Australia's Gross State Product was A$48.9 billion starting 2004, making it A$32,996 per capita. Exports for 2006 were valued at $9.0bn with imports at $6.2bn. Private Residential Building Approvals experienced 80% growth over the year of 2006. South Australia receives the least amount of federal funding for its local road network of all states on a per capita and a per kilometre basis. In 2013, South Australia was named by Commsec Securities as the second lowest performing economy in Australia. While some sources have pointed at weak retail spending and capital investment, others have attributed poor performance to declines in public spending. South Australia has the lead over other Australian states for its commercialisation and commitment to renewable energy. It is now the leading producer of wind power in Australia. Renewable energy is a growing source of electricity in South Australia, and there is potential for growth from this particular industry of the state's economy. The Hornsdale Power Reserve is a bank of grid-connected batteries adjacent to the Hornsdale Wind Farm in South Australia's Mid-North region. At the time of construction in late 2017, it was billed as the largest lithium-ion battery in the world, although, to put it into context, it only has the capacity to power the equivalent of 30,000 homes for one hour. The Olympic Dam mine near Roxby Downs in northern South Australia is the largest deposit of uranium in the world, possessing more than a third of the world's low-cost recoverable reserves and 70% of Australia's. The mine, owned and operated by BHP Billiton, presently accounts for 9% of global uranium production. The Olympic Dam mine is also the world's fourth-largest remaining copper deposit, and the world's fifth largest gold deposit. There was a proposal to vastly expand the operations of the mine, making it the largest open-cut mine in the world, but in 2012 the BHP Billiton board decided not to go ahead with it at that time due to then lower commodity prices. Crown land held in right of South Australia is managed under the Crown Land Management Act 2009. South Australia is a constitutional monarchy with the Queen of Australia as sovereign, and the Governor of South Australia as her representative. It is a state of the Commonwealth of Australia. 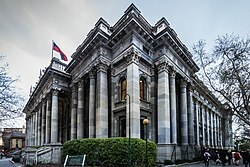 The bicameral Parliament of South Australia consists of the lower house known as the House of Assembly and the upper house known as the Legislative Council. General elections are held every four years, the last being the 2018 election. Initially, the Governor of South Australia held almost total power, derived from the letters patent of the imperial government to create the colony. He was accountable only to the British Colonial Office, and thus democracy did not exist in the colony. A new body was created to advise the governor on the administration of South Australia in 1843 called the Legislative Council. It consisted of three representatives of the British Government and four colonists appointed by the governor. The governor retained total executive power. In 1851, the Imperial Parliament enacted the Australian Colonies Government Act which allowed for the election of representatives to each of the colonial legislatures and the drafting of a constitution to properly create representative and responsible government in South Australia. Later that year, propertied male colonists were allowed to vote for 16 members on a new 24 seat Legislative Council. Eight members continued to be appointed by the governor. The main responsibility of this body was to draft a constitution for South Australia. The body drafted the most democratic constitution ever seen in the British Empire and provided for universal manhood suffrage. It created the bicameral Parliament of South Australia. For the first time in the colony, the executive was elected by the people and the colony used the Westminster system, where the government is the party or coalition that exerts a majority in the House of Assembly. Women's suffrage in Australia took a leap forward – enacted in 1895 and taking effect from the 1896 colonial election, South Australia was the first in Australia and only the second in the world after New Zealand to allow women to vote, and the first in the world to allow women to stand for election. In 1897 Catherine Helen Spence was the first woman in Australia to be a candidate for political office when she was nominated to be one of South Australia's delegates to the conventions that drafted the constitution. South Australia became an original state of the Commonwealth of Australia on 1 January 1901. South Australia is divided into 74 local government areas. Local councils are responsible for functions delegated by the South Australian parliament, such as road infrastructure and waste management. Council revenue comes mostly from property taxes and government grants. As at March 2018 the population of South Australia was 1,733,500. A majority of the state's population lives within Greater Adelaide's metropolitan area which had an estimated population of 1,333,927 in June 2017. Other significant population centres include Mount Gambier (29,505), Victor Harbor-Goolwa (26,334), Whyalla (21,976), Murray Bridge (18,452), Port Lincoln (16,281), Port Pirie (14,267), and Port Augusta (13,957). On 1 January 2009, the school leaving age was raised to 17 (having previously been 15 and then 16). Education is compulsory for all children until age 17, unless they are working or undergoing other training. The majority of students stay on to complete their South Australian Certificate of Education (SACE). School education is the responsibility of the South Australian government, but the public and private education systems are funded jointly by it and the Commonwealth Government. The South Australian Government provides, to schools on a per student basis, 89 percent of the total Government funding while the Commonwealth contributes 11 percent. Since the early 1970s it has been an ongoing controversy that 68 percent of Commonwealth funding (increasing to 75% by 2008) goes to private schools that are attended by 32% of the states students. Private schools often refute this by saying that they receive less State Government funding than public schools and in 2004 the main private school funding came from the Australian government, not the state government. On 14 June 2013, South Australia became the third Australian state to sign up to the Australian Federal Government's Gonski Reform Program. This will see funding for primary and secondary education to South Australia increased by $1.1 billion before 2019. There are three public and four private universities in South Australia. The three public universities are the University of Adelaide (established 1874, third oldest in Australia), Flinders University (est. 1966) and the University of South Australia (est. 1991). The four private universities are Torrens University Australia (est. 2013), Carnegie Mellon University - Australia (est. 2006), University College London's School of Energy and Resources (Australia), and Cranfield University. 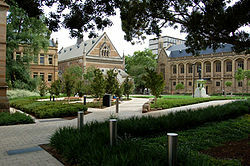 All six have their main campus in the Adelaide metropolitan area: Adelaide and UniSA on North Terrace in the city; CMU, UCL and Cranfield are co-located on Victoria Square in the city, and Flinders at Bedford Park. Tertiary vocational education is provided by a range of Registered Training Organisations (RTOs) which are regulated at Commonwealth level. The range of RTOs delivering education include public, private and 'enterprise' providers i.e. employing organisations who run an RTO for their own employees or members. The largest public provider of vocational education is TAFE South Australia which is made up of colleges throughout the state, many of these in rural areas, providing tertiary education to as many people as possible. In South Australia, TAFE is funded by the state government and run by the South Australian Department of Further Education, Employment, Science and Technology (DFEEST). Each TAFE SA campus provides a range of courses with its own specialisation. After settlement, the major form of transport in South Australia was ocean transport. Limited land transport was provided by horses and bullocks. In the mid 19th century, the state began to develop a widespread rail network, although a coastal shipping network continued until the post war period. Roads began to improve with the introduction of motor transport. By the late 19th century, road transport dominated internal transport in South Australia. 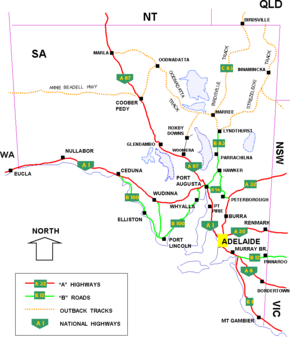 South Australia has four interstate rail connections, to Perth via the Nullarbor Plain, to Darwin through the centre of the continent, to New South Wales through Broken Hill, and to Melbourne–which is the closest capital city to Adelaide. Rail transport is important for many mines in the north of the state. The capital Adelaide has limited commuter rail transport. 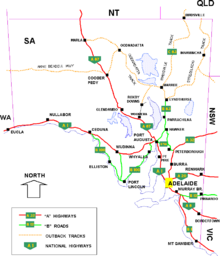 South Australia has extensive road networks linking towns and other states. Roads are also the most common form of transport within the major metropolitan areas with car transport predominating. Public transport in Adelaide is mostly provided by buses with regular services throughout the day. Adelaide Airport provides regular flights to other capitals, major South Australian towns and many international locations. The airport also has daily flights to several Asian hub airports. Adelaide Metro buses J1 and J1X connect to the city (approx. 30 minutes travel time). Standard fares apply and tickets may be purchased from the driver. Maximum charge (September 2016) for Metroticket is $5.30; off-peak and seniors discounts may apply. The River Murray was formerly an important trade route for South Australia, with paddle steamers linking inland areas and the ocean at Goolwa. South Australia has a container port at Port Adelaide. There are also numerous important ports along the coast for minerals and grains. The passenger terminal at Port Adelaide periodically sees cruise liners. Kangaroo Island is dependent on the Sea Link ferry service between Cape Jervis and Penneshaw. Australian rules football is the most popular spectator sport in South Australia, with South Australians having the highest attendance rate in Australia. The state also has the highest participation rate of people taking part in Australian rules football. South Australia fields two teams in the Australian Football League national competition: the Adelaide Football Club and Port Adelaide Football Club. As of 2015 the two clubs are in the top five in terms of membership numbers, with both clubs' membership figures reaching over 60,000. Both teams have used the Adelaide Oval as their home ground since 2014, having previously used Football Park (AAMI Stadium). 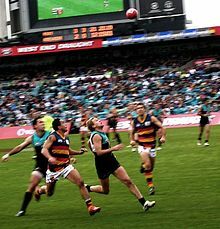 The South Australian National Football League, which owns Football Park, is a popular local league comprising ten teams (Sturt, Port Adelaide, Adelaide, West Adelaide, South Adelaide, North Adelaide, Norwood, Woodville/West Torrens, Glenelg and Central District). The South Australian Amateur Football League comprises 68 member clubs playing over 110 matches per week across ten senior divisions and three junior divisions. The SAAFL is one of Australia's largest and strongest Australian rules football associations. Cricket is the most popular summer sport in South Australia and attracts big crowds. South Australia has a cricket team, the South Australian Redbacks, who play at Adelaide Oval in the Adelaide Park Lands during the summer; they won their first title since 1996 in the summer of 2010–11. Many international matches have been played at the Adelaide Oval; it was one of the host cities of 2015 Cricket World Cup, and for many years it hosted the Australia Day One Day International. South Australia is also home to the Adelaide Strikers, an Australian men's professional Twenty20 cricket team that competes in Australia's domestic Twenty20 cricket competition, the Big Bash League. Adelaide United represents South Australia in soccer in the men's A-League and women's W-League. The club's home ground is Hindmarsh Stadium (Coopers Stadium), but occasionally plays games at the Adelaide Oval. The club was founded in 2003 and are the 2015–16 season champions of the A-League. The club was also premier in the inaugural 2005–06 A-League season, finishing 7 points clear of the rest of the competition, before finishing 3rd in the finals. Adelaide United was also a Grand Finalist in the 2006–07 and 2008–09 seasons. Adelaide is the only A-League club to have progressed past the group stages of the Asian Champions League on more than one occasion. Adelaide City remains South Australia's most successful club, having won three National Soccer League titles and three NSL Cups. City was the first side from South Australia to ever win a continental title when it claimed the 1987 Oceania Club Championship and it has also won a record 17 South Australian championships and 17 Federation Cups. West Adelaide became the first South Australian club to be crowned Australian champion when it won the 1978 National Soccer League title. 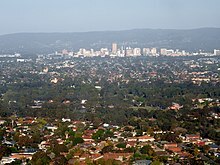 Like City, it now competes in the National Premier Leagues South Australia and the two clubs contest the Adelaide derby. Basketball also has a big following in South Australia, with the Adelaide 36ers playing out of an 8,070 seat stadium in Findon. The 36ers have won four championships in the last 20 years in the National Basketball League. The Titanium Security Arena, located in Findon, is the home of basketball in the state. Mount Gambier also has a national basketball team – the Mount Gambier Pioneers. The Pioneers play at the Icehouse (Mount Gambier Basketball Stadium) which seats over 1,000 people and is also home to the Mount Gambier Basketball Association. The Pioneers won the South Conference in 2003 and the Final in 2003; this team was rated second in the top five teams to have ever played in the league. In 2012, the club entered its 25th season, with a roster of 10 senior players (two imports) and three development squad players. Australia's premier motor sport series, the Supercars Championship, has visited South Australia each year since 1999. South Australia's Supercars event, the Adelaide 500, is staged on the Adelaide Street Circuit, a temporary track laid out through the streets and parklands to the east of the Adelaide city centre. Attendance for the 2010 event totalled 277,800. An earlier version of the Adelaide Street Circuit played host to the Australian Grand Prix, a round of the FIA Formula One World Championship, each year from 1985 to 1995. Mallala Motor Sport Park, a permanent circuit located near the town of Mallala, 58 km north of Adelaide, caters for both state and national level motor sport throughout the year. The Bend Motorsport Park, is another permanent circuit, located just outside of Tailem Bend. Sixty-three percent of South Australian children took part in organised sports in 2002–2003. The ATP Adelaide was a tennis tournament held from 1972 to 2008 that then moved to Brisbane and was replaced with The World Tennis Challenge a Professional Exhibition Tournament that is part of the Australian Open Series. Also, the Royal Adelaide Golf Club has hosted nine editions of the Australian Open, with the most recent being in 1998. The state has hosted the Tour Down Under cycle race since 1999. ^ "Wordwatch: Croweater". ABC NewsRadio. Archived from the original on 15 September 2005. Retrieved 11 October 2011. ^ Most Australians describe the body of water south of the continent as the Southern Ocean, rather than the Indian Ocean as officially defined by the International Hydrographic Organization (IHO). In the year 2000, a vote of IHO member nations defined the term "Southern Ocean" as applying only to the waters between Antarctica and 60 degrees south latitude. ^ South Australian Police Historical Society Inc. Archived 1 October 2011 at the Wayback Machine Accessed 13 September 2011. ^ "Kangaroo Island Council – Welcome". Kangaroo Island Council. Retrieved 10 August 2010. ^ "The Wakefield Model of Systematic Colonisation in South Australia". 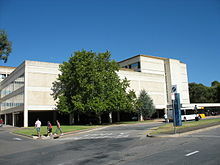 University of South Australia. 2008. ^ "Transcript of the South Australia Act, 1834" (PDF). Museum of Australian Democracy at Old Parliament House. Retrieved 27 December 2018. ^ a b "Documenting Democracy". ^ Ngadjuri Walpa Juri Lands and Heritage Association (n.d.). Gnadjuri. SASOSE Council Inc. ISBN 978-0-646-42821-5. ^ "Highest Mountains". Geoscience Australia. Archived from the original on 21 April 2006. Retrieved 28 May 2006. ^ "Climate and Weather". Government of South Australia. Atlas South Australia. 28 April 2004. Archived from the original on 15 March 2010. Retrieved 6 December 2009. ^ a b c d e "1345.4 – SA Stats, Jun 2011". Abs.gov.au. 2011-06-28. Retrieved 2016-07-17. ^ a b "Health now our biggest employer". adelaidenow. 2016-07-07. Retrieved 2016-07-17. ^ "Australia's Trade by State and Territory 2013–14" (PDF). Australia Unlimited. February 2015. Retrieved February 28, 2017. ^ Puddy, Rebecca (31 May 2012). "South Australia loses AAA rating in credit rating downgrade". The Australian. Retrieved 1 September 2015. ^ "Inquiry into Local Government and Cost Shifting" (PDF). Australian House of Representatives. 2003. Archived from the original (PDF) on 10 July 2007. Retrieved 11 June 2007. ^ a b "SA Lags on Economic Growth". 2013-07-21. ^ "Economic report confirms tough times in South Australia". ABC News. 2013-06-27. ^ "Wind Energy – How it works". Clearenergycouncil. Archived from the original on 21 June 2011. Retrieved 6 October 2011. ^ "Hornsdale Power Reserve". Retrieved 4 December 2017. ^ Gemma Daley; Tan Hwee Ann (3 April 2006). "Australia, China Sign Agreements for Uranium Trade (Update5)". Bloomberg. Retrieved 27 April 2012. ^ Ian Lambert; Subhash Jaireth; Aden McKay; Yanis Miezitis (December 2005). "Why Australia has so much uranium". AusGeo News. Retrieved 27 April 2012. ^ BHP shelves Olympic Dam as profit falls a third. ABC News, 22 August 2012. Retrieved on 16 July 2013. ^ R v Governor of South Australia; Ex parte Vardon  HCA 31, (1907) 4 CLR 1497, High Court (Australia). ^ "Legislative Council 1843–1856". Parliament of South Australia. 2005. Archived from the original on 25 August 2006. Retrieved 28 May 2006. ^ Change name (2011-01-28). "The Right to Vote in Australia". Australian Electoral Commission. Retrieved 2016-07-17. ^ "Women's Suffrage Petition 1894: parliament.sa.gov.au" (PDF). Retrieved 2016-07-17. ^ "3218.0 – Regional Population Growth, Australia, 2016–17: Main Features". Australian Bureau of Statistics. Australian Bureau of Statistics. 24 April 2018. Retrieved 13 October 2018. Estimated resident population, 30 June 2017. ^ a b c d e f g "3218.0 – Regional Population Growth, Australia, 2016–17: Population Estimates by Significant Urban Area, 2007 to 2017". Australian Bureau of Statistics. Australian Bureau of Statistics. 24 April 2018. Retrieved 12 October 2018. Estimated resident population, 30 June 2017. ^ Owen, Michael (22 May 2006). "School leaving age to be raised". The Advertiser. News Corp. Archived from the original on 14 September 2007. Retrieved 28 May 2006. ^ "The Redefinition of Public Education". Archived from the original on 15 February 2008. Retrieved 12 July 2010. ^ "Chapter 2: Resourcing Australia's schools". Ministerial Council National Report on Schooling in Australia. Archived from the original on 2013-10-16. ^ Bill Daniels (12 April 2004). "Government funding should encourage private schools not penalise them". Retrieved 16 February 2010. ^ "South Australia signs up to Federal Government's Gonski education reforms". 2013-06-14. ^ 4174.0 Sports Attendance, Australia, 2005–06, 25 January 2007, Australian Bureau of Statistics. Retrieved on 5 July 2009. ^ South Australian Amateur Football League Archived 2 July 2009 at the Wayback Machine. Retrieved on 5 July 2009. ^ "Reds finalise squad for ACL Knockout Stage – Adelaide United FC 2013". Footballaustralia.com.au. Archived from the original on 3 December 2013. Retrieved 16 July 2013. ^ Children's Participation in Cultural and Leisure Activities, April 2003, Australian Bureau of Statistics. Retrieved 14 January 2013. ^ Keane, Daniel (12 March 2015). "Victoria may gloat about poaching the Grand Prix, but SA gained a lot by losing it". abc.net.au. Retrieved 21 January 2017.